Race to Destiny is a board game designed to simulate the experiences of young black men in challenged neighborhoods to achieve a greater understanding of their experiences and obstacles. It anticipates a policy shift that depends on the services you provide to these young men. Service providers can adjust/change what is being done to allow for more opportunities of success for these young men. The problems that this unique participant game addresses are the systemic barriers to success and and an understanding of the experience of young black men. The game encourages conversations About Race Beyond the Numbers. We are still seeing perpetual conditions in the Urban League “State of Black America” and Wisconsin Counsel-Children and Families “Race to Equity”. Race to Destiny provides a facilitated and guided experience (i.e. presentation, video, board game and articles) that allows for a less defensive and richer conversation about race and institutional systems. The mission of Race To Destiny is to impact our world by educating the listening public about the realities of young black men in society. 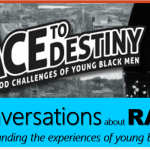 Race to Destiny explores the neighborhood challenges of young black men by participating in a person-to-person simulation followed by a discussion. We invite you to play the game. © 2017 RaceToDestiny.com. All Rights Reserved.